BARILOCHE, Argentina - It was late in the afternoon by the time we reached the car rental office in the Patagonian city of San Carlos de Bariloche after a delayed flight from Buenos Aires. With a long drive ahead of us to reach the resort town of San Martin de Los Andes to the north and evening approaching, we were eager to get going. I told the agent that we planned to take the Ruta de los Siete Lagos, or Route of the Seven Lakes, which runs through the foothills of the Andes mountain range. On the small map in our guidebook, it appeared to be the most direct drive. “Ooof,” he groaned, then pulled out a map to trace an alternate route that looked like a big detour. “This section here,” he said, pointing to a dotted line that was most of our planned drive, “is all dirt. It will take you two hours.” Sure thing, I thought, we could cover the 68 miles in an hour tops, especially if we pushed at the same madcap pace of Argentine drivers. The agent, of course, was right. What followed was a three-hour, bone-jarring journey through the foothills of the Andes Mountains across a road studded with fist-size rocks, blind turns, and gullies bored into the dirt by recent rains that tested the strength of the rental car’s axles and our desire for the road less traveled. All the while dodging the occasional oncoming driver, stray cow in the middle of the road and construction workers who seemed to be laying down an even coarser coat of dirt and rock. But the road wasn’t the only reason the drive took so long. Each twist brought a new spread of Andean scenery - towering mountains competing with each other for height and scenic grandeur. Snow lay across the highest peaks, and others were stark cliffs that exposed dark rock, crumpled and craggy. Gradual slopes carpeted with evergreens spread down to rich blue lakes, some small and placid, others large enough that the wind stirred up foot-high waves. In creeks feeding the lakes, fly fishermen cast from the gravel beds for the trout that are a staple of Patagonian grills. Even with seven lakes to pass, the vistas never became routine. My brother and I and our wives went to Patagonia as a break from Buenos Aires, a city that like New York never sleeps but can often make you feel as if you need a good nap if you’re not accustomed to dinners that start at 11 p.m. and a nightlife that doesn’t end until midmorning the next day. A two-hour flight brought us to Bariloche, halfway down the Argentine Andes near the border with Chile. Many travelers use Bariloche as a base for exploring the national parks in the region. But we heeded the advice of a Lonely Planet guidebook that it was a bit touristy and headed directly to San Martin, a small town known for its proximity to skiing in the winter and hiking in the summer. We drove north from Bariloche, through vast expanses of flat, dry scrub land and then skirting the shores of the giant Nahuel Huapi lake that weaves through the mountains for miles. Often considered an eighth lake on the route, it is by far the most impressive, with glacial waters that are such a deep cobalt blue they seem to glow. We passed through Villa La Angostura, a small town that is a good stopping point for hikes with commanding views of the lake. Several boat companies run day tours on the lake, and the surrounding area is filled with resorts, a few decent restaurants in a short downtown strip, hotels and cabins that can be rented for relatively low prices. The seven-lakes route, labeled Ruta Nacional 234 on maps, begins on the outskirts of Angostura and traverses two national parks. About two-thirds of the drive is over dirt roads, which in some places are better groomed than others. In heavy rain, or winter weather, it can be a hazardous trip. But the difficult terrain has some benefits. The traffic is often light, and except for the occasional tour bus blundering around a blind turn, most of the other vehicles are small compact cars or pick-up trucks. There are even a few hardy, but certainly tired, bikers pedaling up the sometimes steep slope of the road. Our car-rental agent had warned us to bring water and food in case of a breakdown, but there are a few small settlements of the native Mapuche, the region’s original inhabitants. Occasional turnoffs lead to small quinchos (snack bars) that sell coffee, sandwiches and tortas fritas, squares of warm fried dough that can be bought for as little as 30 cents. Lakefront campgrounds offer other stopping points. Otherwise, the drive is uninterrupted scenery. The lakes vary in size. Lago Escondido, or hidden lake, is a small pool visible only through a thick stand of trees. Lago Espejo, the first of the seven on a drive from the south, was a wide vista, still and glassy, casting such a vivid and clear reflection of the mountains behind it in the distance that it made any photo look near professional. The dirt gives way to pavement about an hour into the drive, pushing higher into the mountains, the forest giving way to craggy peaks and valleys covered with scrub brush, small trees and purple-headed thistles growing near the guard rails. The lakes are larger and more exposed, with choppy waters. One, Lake Falkner, is watched over by stark black rock spires that sit at the lake’s midpoint, a good stop for photos. The road cuts into the cliffside as it descends along the shore of the last of the seven, Lago Lacar, into San Martin. The town, named for the general who liberated the Andes from Spain in the 19th century, is much smaller than Bariloche, but has a thriving tourist industry. It felt a bit like a ski resort in the American West, minus the glitz and crowds. Apartment hotels are common, each with deeply varnished wood frames that complete the ski-chalet feel. They are also affordable - we split a waterfront, three-story unit with a kitchen, three bedrooms and a large living room for $66 per night. 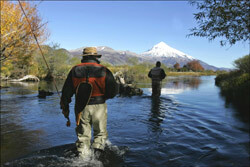 To the north is Junin de los Andes, a more down-market cousin but the site of some of Argentina’s best fly fishing. And to the west is Volcan Lanin, a sharp dome formed by an active volcano that towers above the area’s other mountains, tall enough to generate its own small wispy clouds that lazily float around its peak. Hiking and backcountry excursions can be arranged through the tourist office and outfitters in San Martin. Three days later, we headed back to Bariloche for our flight back to Buenos Aires. Once again, ignoring the agent’s advice, we took the scenic route. After all, what’s a few more hours when you’ve got a view like that? Route Of The Seven Lakes: A drive through Argentina’s lake district in the foothills of the Andes Mountains; http://www.welcomeargentina.com/paseos/sietelagos-sma/index-i.html. Argentina tourism office in New York: 212-603-0443. Getting There: Most travelers start from Bariloche, where Aerolineas Argentinas and the Chilean airliner LAN run daily flights to and from Buenos Aires and Santiago. A flight takes around two hours. Traveling by bus is much cheaper and the buses are comfortable, but it takes about 20 hours one-way.